Before beginning their next class project, 12 students in Professor Gwin Faulconer-Lippert’s Audio Production class received advice from sound recording professionals when they visited RK-1 Studios in Edmond this semester. 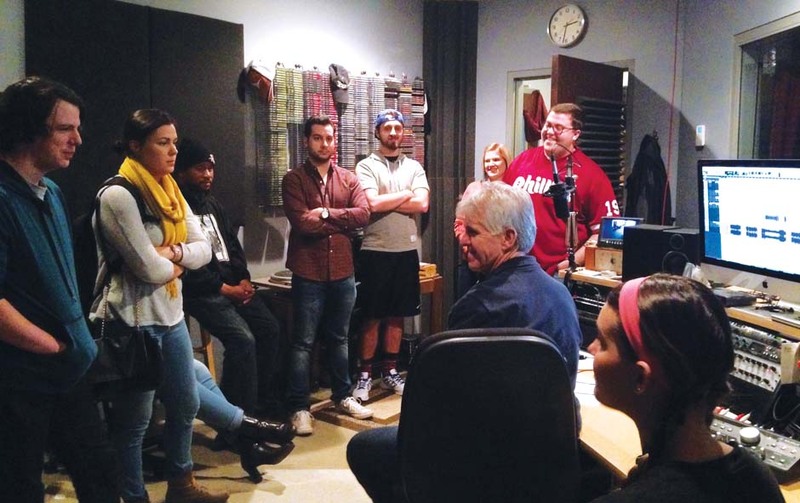 Audio Production students are assigned to record two radio spots, said Gwin Faulconer-Lippert, mass media communications professor. As part of the tour, Randy Kemp invited the group into his workroom and played a number of radio spots, some old, some new, and most still played on air today. Kemp is RK-1 Studios founder and owner. Faulconer-Lippert said she instructed students to watch Kemp’s face and body movement as he stepped into the booth to record a commercial, so when they returned to class, they could apply his techniques when they recorded. “I really liked how we got to see him do a commercial and realize it’s OK to mess up and go back and redo it,” said Ashley Guyer, broadcast journalism major. RK-1 Studios is in the business of recording commercial, film, video, and much more. When this reporter tagged along, students witnessed a commercial in the making in the “green room” while Kemp led the group through a two-hour tour of the studio. Kemp has 45 years of experience and recognitions including the American Advertising Federation Silver Medal and Sterling Service Awards. Abigail Connell, public speaking major, said the experience enabled her to connect the concepts taught in class to real world application. Faulconer-Lippert said the relationship between OCCC students, Randy Kemp, and RK-1 Studios began 15 years ago, when she asked the well-known on-air personality if she could bring students to his studio. Faulconer-Lippert said she and Randy Kemp had previously recorded together. Randy Kemp agreed and the rest is history. Although he has no official ties with OCCC, Kemp was inducted into OCCC’s Alumni Hall of Fame in 2014. Faulconer-Lippert said she nominated Kemp in recognition for his continuing participation with OCCC students through studio tours.